Sunday brunch is one of my favorite meals! I have such fond memories of preparing late morning (or early afternoon) omelets, French toast or pancakes for my daughters as they were growing up. Nowadays it just Kat and I most weekends but that hasn’t diminished the joy of getting in the kitchen with a hot cup of coffee and whipping up something tasty and interesting on a lazy Sunday afternoon. I had bought some amazing looking shrimp earlier this week so today I was looking for recipes with shrimp and eggs. I had thought of egg fu yung but that would mean a trip to the store. A frittata sounded interesting too but with ginger and garlic on my mind I found this recipe on one of my favorite web sites! Using Shao’s recipe for inspiration I added potatoes for substance and a little Sriracha for warmth and came up with an interesting dish that would even make for a light and easy weeknight dinner. Served with a simple slaw of mixed cabbage tossed with a little rice wine, rice wine vinegar, and sesame oil this was a satisfying and delicious Sunday Brunch. Notes: This recipe serves two. A wok would be a perfect cooking vessel for this, especially if you were going to double the recipe. Be careful not to over beat the eggs, there should still be some separation between the whites and the yolks. And, do add a little more Sriracha at the table for a great boost of flavor to wake up your taste buds! In a bowl (or a zip lock bag) add 1 tablespoon of kosher salt and the baking soda to 2 cups of water and stir (or shake) to dissolve. Add the shrimp and chill in the refrigerator for 20 to 30 minutes. Meanwhile in a small saucepan over high heat bring 3 cups of water to a boil with 1 tablespoon of kosher salt and the potatoes. When the water reaches a boil reduce the heat to medium and cook until the potatoes test “almost” tender. About 10 minutes. Drain the potatoes into a strainer and shake to remove excess liquid. Set the strainer, with the potatoes, back over the saucepan to allow the potatoes to steam dry. When you are ready to cook the eggs, remove the shrimp from the brine, rinse in cold water, and pat dry. Place a 10 inch non-stick pan over medium heat and melt ½ of the butter with ½ tablespoon of sesame oil. Add the potatoes and cook, shaking the pan and stirring to turn only every couple of minutes. Cook until the cubes are nicely browned on all sides. Gently beat the eggs together with the remaining soy sauce, the chili sauce, and about 1/8 teaspoon each of kosher salt & fresh ground pepper. Add the pan back to medium heat and melt the remaining butter with ½ tablespoon of sesame oil. Swirl the pan to distribute the oil then add the eggs. Cook 30 seconds then shake the pan a little to loosen the eggs. Continue giving the pan and occasional shake while using a rubber spatula to break up the curds moving them towards the center of the pan. 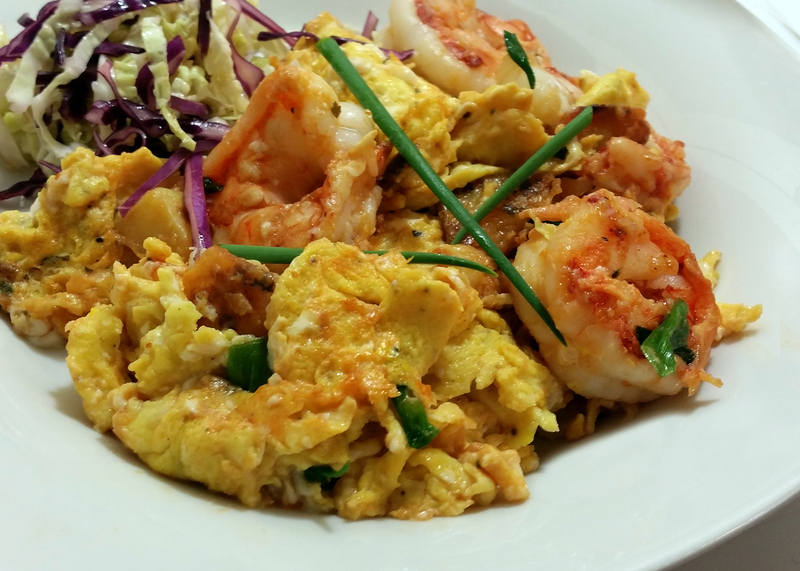 When the eggs are mostly cooked with some still a little loose, gently stir the shrimp mixture into the pan. Cook no more than one more minute as you gently stir to combine. Serve immediately garnished with a few sprigs of scallion and a little hot chili sauce on the side. What? Shrimp again? Well, football season is now in full swing and I prepared these shrimp at our first Miami Dolphins tailgate party. They were such a hit that I had several requests for the recipe the very next day. This recipe presents a perfect opportunity to mention “levels of flavor” once again as these shrimp benefit from the flavor boosts of the prosciutto and the rosemary. While they are very good without the prosciutto (and I have made them that way for friends that do not eat pork), the addition of the prosciutto, in all its salty, crispy, goodness, really does add another level of flavor that makes these shrimp a very special treat! Add to that the fresh rosemary branches used as skewers and while you can certainly use bamboo or metal skewers, taking the extra step and using the rosemary adds a smoky, piney bite as the branches smolder on the grill and again another level of flavor that I think knocks these shrimp right over the top of the flavor scale. As if those 2 levels of flavor were not enough, along comes the citric acidity of the lime juice and the kick of the horseradish in the Key Lime Cocktail Sauce to again take it to another level and a good dish suddenly becomes the hit of the party. Touchdown! Combine all ingredients and stir to mix well, chill thoroughly before serving. 4 to 8 – Fresh Rosemary branches, leaves removed (with 2-3 inches of leaves remaining at the tip). In a medium-sized mixing bowl combine half of the lemon zest with the next 2 ingredients, add a pinch of kosher salt and several good grinds of black pepper (about ½ tsp) then roughly ¼ cup of olive oil. Whisk until the olive oil begins to emulsify (or thicken). Gently toss the shrimp in this mixture until well coated, cover and refrigerate at least 1 hour. 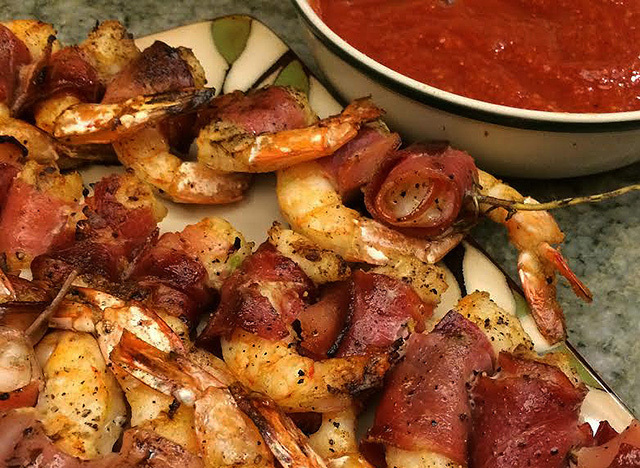 While the grill is heating up, wrap each shrimp individually with a strip of the prosciutto. Using the rosemary branches as skewers, thread the shrimp evenly on 4 to 8 of the skewers (depending on the length of the branches). Drizzle the skewered shrimp with a little more olive oil, sprinkle them evenly with the remaining lemon zest and a few more grinds of black pepper. This has long been one of my favorite fish recipes. 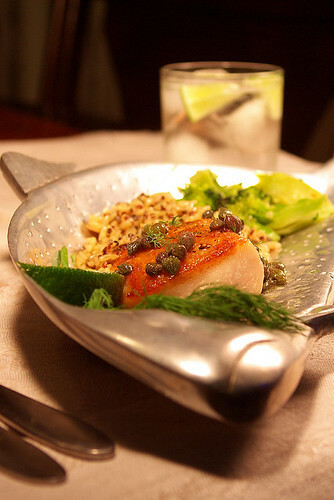 I love the taste of the lime and the capers and the vodka is always an interesting ingredient; together these flavors compliment the fish perfectly. The fresh dill brings a nice finishing touch by adding a fresh bite as well as an attractive visual component. Once you’ve had a little practice it only takes 10 minutes or so to prepare and it’s an impressive and tasty enough dish for company. There is really nothing complicated about pan-searing. You may have noticed already, I use the technique a lot. It really is a very convenient way to cook fillets, steaks, or chops when you don’t have hours to spend in the kitchen. What makes pan-searing even more appealing to me is the browning really gives whatever you are cooking a real boost of flavor. Called the Maillard Reaction, this crust of caramelized goodness is the secret behind many delicious restaurant dishes. Moisture prevents browning – You will often hear me preach about getting the surface of your fish (or any other protein) dry before searing it. When pan-searing it’s especially important to remember that moisture will inhibit browning. Oil on the other hand promotes browning. How hot is hot? – Ok, as well as I can describe it; when you heat a pan and add olive oil, then leave the oil to get hot, there is a point just before the oil begins to smoke. At this point the molecules in the oil have loosened or thinned about as much as they are going to and the surface of the oil takes on a shimmering look. That is the right heat for pan-searing. Wow! That’s really hot! – Always remember: you can move that pan off the fire. Any time you feel your pan might be getting too hot the first step is to simply move it off the burner. Never panic! Be careful and be confident. Notes: Firm white fish is ready when the fish flakes easily with a fork and the flesh in the center is almost solid white showing very little if any transparency. Remember, fish will continue cooking for a minute or two after you remove it from the heat so be careful not to overcook it. Depending on the thickness of your fillets it should take no longer than 5 to 7 minutes in the oven to finish cooking through. Side notes: Yes, this recipe contains butter…possibly as much a 1 tablespoon (or pat) per serving which if you think about it really isn’t that much. Once in a blue moon I do allow myself the pleasure and I hope you will too! Pre-heat the oven to 400 and use a paper towel to dab the fish to dry it very well. Season both sides with salt & pepper then heat 2 tablespoons of olive oil in a non-stick pan over medium-high heat until shimmering hot. Swirl the pan to evenly coat the cooking surface and carefully place the fish, skin side up / flesh side down, in the pan. Cook 3 minutes (without moving) then gently turn over and cook 3 minutes more. Carefully remove the fish to an oven-proof dish and place it in the oven to finish cooking through. While the pan is still hot, pour out any excess oil and with the pan still off the heat add the lime juice. Swirl the sizzling juice for about 30 seconds then add the vodka and return the pan to the heat. Simmer, swirling the pan from time to time until the liquid begins to thicken, about 3 minutes. Add 4 of the butter cubes and swirl the pan as they melt. Reduce the heat to medium and when the first 4 cubes of butter have melted swirl or whisk in 4 more while alternately moving the pan on and off the heat. (Note: The pan should stay hot enough to keep the butter melting but not so hot that the butter burns or separates from the sauce.) When the butter has melted, add the capers along with 4 more butter cubes. Continue gently whisking as the butter melts, finish the sauce by melting the last 4 cubes of butter and set the pan off the heat while you plate the fish. The fish should be done about the same time as the sauce. Check to make sure the fillets have cooked through, leaving it a little longer if necessary. Carefully (it’s hot!) remove the fish from the oven and place each fillet on a plate. Spoon some of the sauce and the capers over each fillet then use a pair of kitchen shears or scissors to snip a sprinkling of fresh dill over each serving. Serve with a little sprig of dill and a slice of lime on the side. I actually made the dish in the photo one evening while my wife was out of town. After a couple of nights of take-out food I was ready for a real meal so I stopped by Costco on my way home from work. I was happy to find they had one of my favorite fish in the fresh fish section, Corvina! With this beautiful fish and the fresh lemons I already had on hand it wasn’t hard to decide on a theme for my dinner for one. Often when preparing a meal I look for one common theme that will highlight each part of the menu. Whether it’s garlic, an herb such as thyme or rosemary, or in this case fresh lemon, I use my theme ingredient in each of the dishes I serve. To my thinking this creates a common thread throughout the meal that not only links and compliments the flavors of the food…I think it makes the meal that much more interesting! The recipes for this menu are written for two but the ingredients can easily be doubled. The Cool Beans Salad is best made ahead of time and refrigerated at least two hours. In a medium sized mixing bowl combine the first 5 ingredients. Follow the directions on the package for mixing the dressing, using lemon juice in place of the vinegar. Gently toss the salad with only enough dressing to coat. (There should be very little pooling of dressing in the bottom of the bowl.) Chill before serving. Warm 1 tbsp of olive oil in a 10” skillet over medium heat. When the oil begins to shimmer add the onions and cook stirring often until some browning begins to occur. Add the squash (zucchini and yellow) and thyme, and continue cooking. Stir occasionally until squash is mostly cooked but still a little firm in the center (tender crisp) then season with salt & pepper. Toss with the lemon juice, turn off the heat, and leave the skillet on the burner to stay warm until serving. Heat 4 tbsp olive oil in a large pan over medium high heat until shimmering. Season fish pieces with salt & pepper, dust each with flour (shaking off excess), then dredge in egg to completely coat. Gently and carefully lay the fish into the pan, you should immediately hear sizzling. When the liquid has reduced to almost a syrup, remove the lemon slices and turn off the heat. Add the butter 2 or 3 pieces at a time whisking into the sauce as the butter melts. When each addition of butter has completely melted, add the next 2 or 3 pieces until all has been incorporated into the sauce. By the time the last of the butter has been melted the sauce should be just the right consistency. If it is too thick, stir in a splash of wine to loosen…if it is too liquid just let it cook with the residual heat another minute or so. Just before serving stir in the fresh herbs. 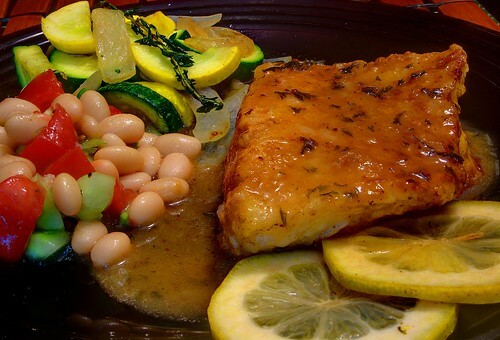 Serve the fish with a lemon slice and the sauce and enjoy! 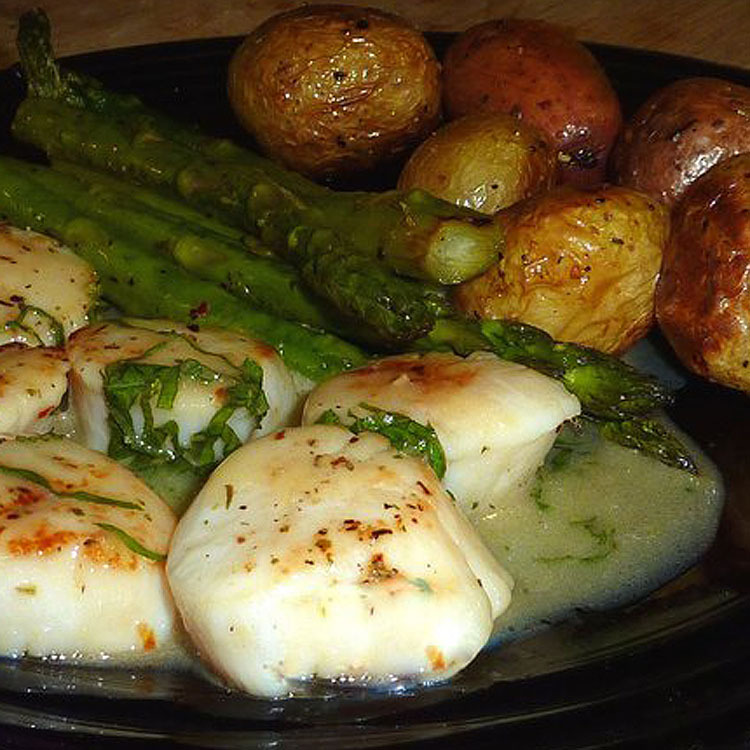 Menu for Two – Pan Seared Sea Scallops with a Fresh Herb White Wine Sauce, Oven Roasted Potatoes and Asparagus Spears. Last week my wife Kathy had a rough week fighting the cold that I probably gave her when I had it the week before. Since she was feeling somewhat better by Friday I wanted to cook her something special so I went browsing at Costco for something out of the ordinary. With a crispy salad and some crusty bread, these scallops fit the bill perfectly! I shop at Costco or BJ’s often as bulk stores are a great way to stretch your grocery bucks. For instance, while you might find nice fat Sea Scallops (nearly always pre-frozen) at a local seafood market or grocery for 12.99 to 15.99 per pound, these came in just over 9.00 per pound for a two pound bag. Two pounds are enough for 3 dinners for the two of us and that boils down to about $6.00 per meal or $3.00 per person. Just try to find that kind of deal at a seafood restaurant! Speaking of buying frozen seafood; for a very long time I absolutely refused to buy frozen scallops or shrimp. While I wouldn’t consider myself a food snob…I simply did not care for the way the frozen ones tasted when compared to fresh. Then I came across an article about sodium tripolyphosphate . Sodium tripolyphosphate is a preservative that packagers will “claim” is used to “retain tenderness and moisture”. In fact it absolutely ruins the flavor and texture of certain foods, especially shrimp and scallops, giving the flesh a diluted, soapy flavor and an unpleasant spongy, almost waterlogged texture. So why do seafood packagers use this additive, which is also used in household cleaners, laundry detergent, and paint? The simple answer is Sodium tripolyphosphate “can substantially increase the sale weight of seafood in particular”. Need I say more? Fortunately, in the U.S., Sodium tripolyphosphate must be listed in the ingredients list on the package label. Also fortunately, Costco and BJ’s both carry frozen shrimp and scallops that do not contain Sodium tripolyphosphate! Do yourself a favor and read the ingredients next time you buy frozen seafood. For the same reason I also try to avoid the “fresh” scallops that are sold soaking in “their own” liquid. Menu for two – Pan seared sea scallops with a fresh herb white wine sauce, oven roasted baby creamer potatoes and asparagus spears. Note: Before I get started on the recipe there is one other tip that I must mention: WATER KILLS BROWNING! In searing and roasting the browning that occurs on the outside surface is where the flavor comes from. Searing your scallops while they are wet will prevent them from browning. To get the most flavor from your browned foods always be sure to pat them dry with a paper or dish towel before cooking. 12 medium – Sea Scallops, thawed, rinsed, and dried well. 3 Tbsp – Butter, Cut into 6 or 8 cubes, and kept cold. 1. Preheat the oven to 425 degrees. Rinse and dry the potatoes. Trim the stem end of the asparagus, rinse and dry. When the potatoes are dry toss them with just enough olive oil to coat, give them a good dusting of seasoning from the Italian herb seasoning grinder and toss again. Spread them evenly in a glass 9 X 12 inch baking dish and roast for 15 minutes. Meanwhile, toss the asparagus spears with just enough olive oil to coat, give them a good dusting of seasoning from the Italian herb seasoning grinder and toss again. Set the asparagus aside. 2. Warm 1 to 2 Tbsp olive oil and 1 sprig of rosemary in a non-stick pan over medium high heat swirling the oil occasionally as it heats. Dust the scallops lightly with the Italian herb seasoning. 3. After 15 minutes carefully remove the potatoes from the oven. Carefully tilt the baking dish so that the potatoes move to one side allowing room to add the asparagus spears. Add the asparagus and place the dish back in the oven for 15 minutes longer. 4. While the vegetables finish roasting, sear your scallops: When the oil in the pan is hot the rosemary will begin to crackle and pop. Remove and discard the rosemary then gently place the scallops, one at a time, into the pan. You should hear a distinct sizzling as soon as each scallop hits the oil. Sear the scallops for two minutes on the first side, gently flip, and sear one minute more before removing directly to serving plates. Cover each plate with a paper towel or foil to keep the scallops warm. 5. Remove the vegetables from the oven and set aside to rest. 6. As soon as the last scallop is removed, add the shallots and the wine to the pan. As the wine comes to a boil swirl the pan and, using a wood or silicone spatula, scrape any browned bits from the pan. Reduce until the wine takes on a syrupy consistency then add the lemon juice. 7. Turn off the burner and allow the residual heat to reduce the liquid by half. Gently swirl in the butter cubes 2 or 3 at a time letting these melt before adding 2 or 3 more. Continue swirling the pan until all of the butter has been incorporated, swirl in the basil and spoon the sauce evenly over the scallops. 8. Carefully place the roasted vegetables on the plate and serve. I Love Shrimp and Grits! I love shrimp and grits and in my travels around the South I have enjoyed more than my fair share of some fine versions of this recipe. Unfortunately shrimp and grits dishes are nearly always loaded with salt and fat. Between the ham or bacon (or ham and bacon), heavy cream, and butter I would not call this dish particularly heart healthy. However if you think about it the main ingredients are not all that bad. Shrimp – Surprisingly, ounce for ounce, shrimp are packed full of low-fat, low calorie protein, they are a good source of selenium, vitamins D and B12 and they actually provide more good cholesterol than bad! Note: If you are using frozen shrimp always buy shrimp that does not contain sodium triphosphate. Grits – Grits are a very good source of antioxidants, dietary fiber, and iron. Cheese – Cheese is one of the best sources of calcium in the world and it’s rich in phosphorus, zinc, riboflavin, vitamin B12, and vitamin A. This recipe contains cheddar cheese; did you know that aged cheeses like cheddar are actually good for people that are lactose intolerant? This is because aged cheeses contain very low levels of lactose and can be an important source of calcium for people that suffer from lactose intolerance. My point is, while I don’t want to turn my blog into a “diet” or “nutrition” blog, I believe you can eat smart without having to sacrifice flavor and enjoyment. In this recipe I still use a little fat but every single ingredient brings health benefits to the table, the fat that it does contain is good fat, and your taste buds will still have a little fun! Notes: There is no extra salt added to the recipe because the extra sharp cheddar and the blackening seasonings add enough salt for my taste. The Chipotle Tabasco brings a nice smokiness and the granulated garlic just seems to round out the flavor. If you prefer a “clean eating” style meal, feel free to use low fat cheddar cheese. I like to serve these with fresh spinach sautéed with chopped shallots and plenty of fresh ground pepper. Turn one burner on high and another on low. On the first burner bring the chicken stock to a boil in a large sauce pot with a tight fitting lid. Slowly whisk in the grits, chipotle Tabasco sauce, granulated garlic, and ground black pepper. Move the sauce pan to the burner that is set to low, whisk once more and cover. Stir occasionally and cook 7 or 8 minutes until the grits are thickened. Toss the shrimp with the Blackening Seasonings. When the grits have thickened remove the sauce pan from the heat and fold in the yogurt and the cheese. Continue folding until the cheese has thoroughly melted and blended with the grits. 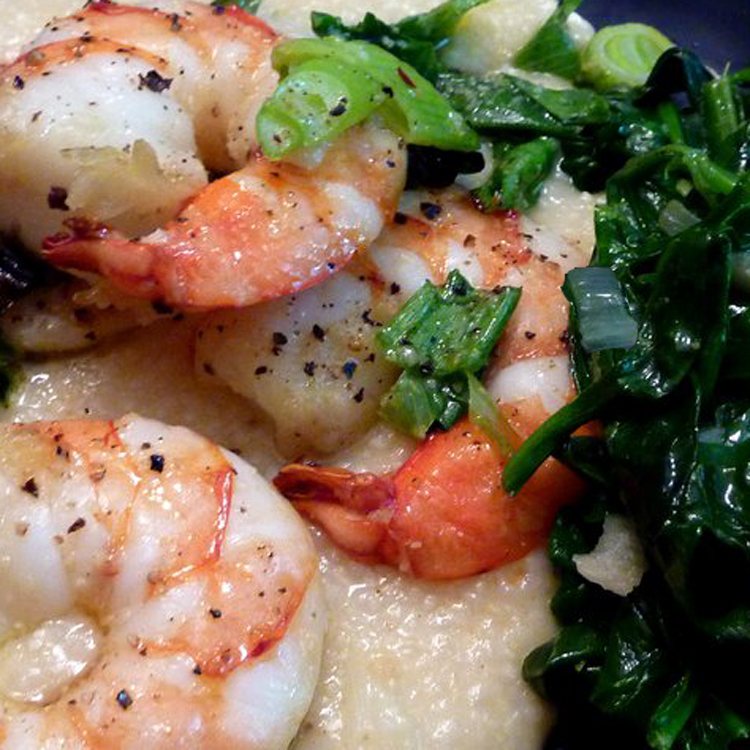 Serve 4 to 6 shrimp per serving over a generous mound of grits.